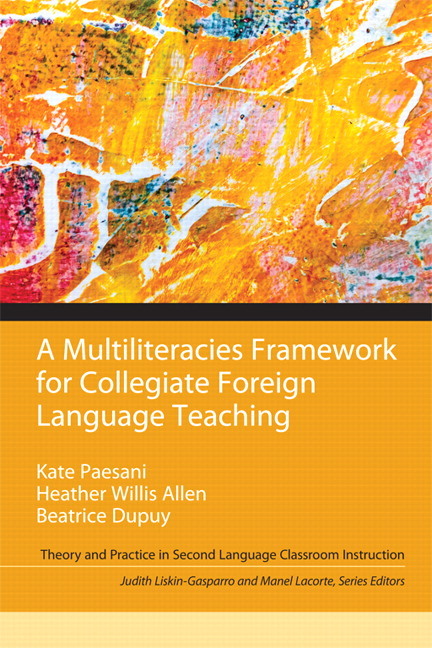 To meet the goals of outlining a coherent pedagogical framework grounded in texts and the concept of literacy and of presenting this framework in an accessible manner for novice collegiate FL teachers, A Multiliteracies Framework for Collegiate Foreign Language Teaching is organized into eight chapters and an afterword. Each chapter reconsiders traditional components of introductory and intermediate FL instruction (e.g., grammar and vocabulary, speaking, reading) according to a literacy orientation. The authors start with a discussion of what is familiar to readers and then emphasize how each of these traditional components works in concert to contribute to the development of students’ FL literacy. Each chapter begins with an Overview that serves to introduce the topic and provide an outline of its contents. The Conceptual Background section summarizes essential research and outlines key concepts and is followed by Pedagogical Applications, which puts theoretical and conceptual knowledge into practice and provides instructional models and examples. The Final Considerations section summarizes the main points of a chapter before readers move on to the two application activities in Transforming Knowledge; one activity is a reflective journaling topic and the other a research topic. Finally, Key Resources and For Further Reading identify important references related to the topic of each chapter; the former provides annotations of the most important research on the topic, the latter does not. Each chapter additionally includes several Learning Activities intended to encourage readers to engage with and think critically about the chapter’s content. Kate Paesani is Associate Professor of French and Director of Beginning French Courses at Wayne State University. Her current research interests include literacy-based foreign language curriculum and instruction, literature across the curriculum, and foreign language teacher development. Beatrice Dupuy is Professor of French and Director of the Basic French Language Program at University of Arizona and serves as Chair of the SLAT Pedagogy Curriculum Sub-committee and Co-Director of CERCLL . She holds a Maîtrise (in English literature) from the Université Paris-Sorbonne (Paris IV), a MS (in TESOL) and Ph.D. (in Education in Language, Literacy and Learning) from the University of Southern California, Los Angeles.